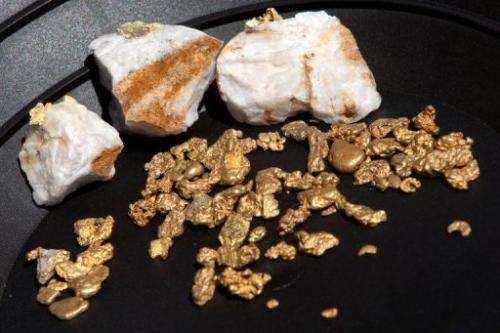 Gold nuggets on display on April 29, 2011 in Jamestown, California. Among the more peculiar organisms that inhabit our Earth exists a bacterium that turns water-soluble gold into microscopic nuggets of solid gold, scientists said Sunday. Among the more peculiar organisms that inhabit our Earth exists a bacterium that turns water-soluble gold into microscopic nuggets of solid gold, scientists said Sunday. Chemists have often pondered why the germ Delftia acidovorans is frequently found on the surface of tiny gold nuggets. Its presence led scientists to speculate it may be creating the particles from soluble gold—ions of gold that are dissolved in water. But the puzzle was how D. acidovorans did this trick, as soluble gold is toxic. The answer, suggest researchers in Canada, lies in a molecule excreted by the microbe that both shields the organism and transforms the poisonous ions into particles. "This finding is the first demonstration that a secreted metabolite can protect against toxic gold and cause gold biomineralisation," the process by which living organisms produce minerals, they wrote in the journal Nature Chemical Biology. The molecule, delftibactin A, is capable of achieving this feat within seconds in pH-neutral conditions at room temperature. Study co-author Nathan Magarvey of Ontario's McMaster University told AFP the study was not designed to show whether it would be viable to use germs to grow gold from water in the lab. But such processes seem "distinctly possible," he said in an email exchange. Previous research had shown that another bacterium found on gold, Ischiadicus metallidurans, deals with toxicity by storing the ions inside its cells. Bacteria need some metals, such as iron, to grow, whereas others, like silver, will kill them. Soluble gold, invisible in a glass of water, is found in the ocean, groundwater and other natural water sources. Solid gold is mainly formed through geological processes in large veins underground. Magarvey said the study may implicate D. acidovorans in secondary deposits such as nuggets found in rivers. The bacterium, he added, is not found only on gold but also in the soil and in water. Still unclear, though, is what the organism feeds on. This goes a long way towards explaining why more gold is found at the outflow of sewage plants than can be explained by the estimated amount worn off dishes, jewelry, dental work, industrial processes and other possible sources. This is a circumstance discovered in Australia a few decades ago, and no-one could figure out why back then. The bacteria could be concentrating gold from the incoming water supply. One cubic meter sea water contains ~1mg gold, so in theory, one might be able to extract around 2 grams of gold from the size of Olympic swimming pool by using efficient microbes. Last time I saw an add where a company offered 45 euros ($60) from 1g of "trash gold".